Everyone's got their waterproof, breathable material, and MSR is no exception. In this case, it's "Hipora", designed to be waterproof and windproof while still allowing for airflow. The Hipora protects against moisture, while the Thinsulate insulation provides extra warmth. 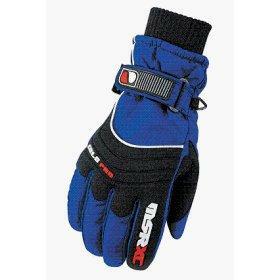 And the extra-long cuffs provide protection against any cold air sneaking in. MSR expects you to wear these in messy weather, so they've also provided an outer liner that's designed to grip even when wet and to be easy to pull on.